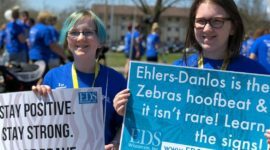 #GivingTuesday Fundraiser for EDS Wisconsin – EDS Wisconsin, Inc.
Want to join me in supporting a good cause? This #GivingTuesday I’m raising money for EDS Wisconsin through our fiscal sponsor Chronic Pain Partners. On Giving Tuesday, Nov 27 Facebook and PayPal will match a total of $7 Million in donations.